These gains in strength-to-weight ratio have encouraged many manufacturers of complex equipment who rely on winch lines, tension lines, and other cable applications—such as in commercial gym equipment—to make the switch to fibrous rope. The improved strength has also allowed for smaller diameter lines, tighter turns, more compact structures, less cumbersome shipping, and more efficient spooling around winches and drums. Fiber ropes are more supple and forgiving than steel cable (and can turn sharper corners, but are more susceptible to cutting). In practice, this means that they’ve got a more dynamic range of motion and will relax when slack, rather than coiling or flexing in rigid arches. A fiber rope conforms to the task at hand and never fights the motion you’re asking of it. Steel cables do tend to attach differently than soft fiber ropes to mating hardware and equipment. Also, splicing or tying types is typically much easier and doesn’t require any specialized machinery, which ultimately makes replacement in the field easier. Another option is a thimble specially constructed for synthetic rope. 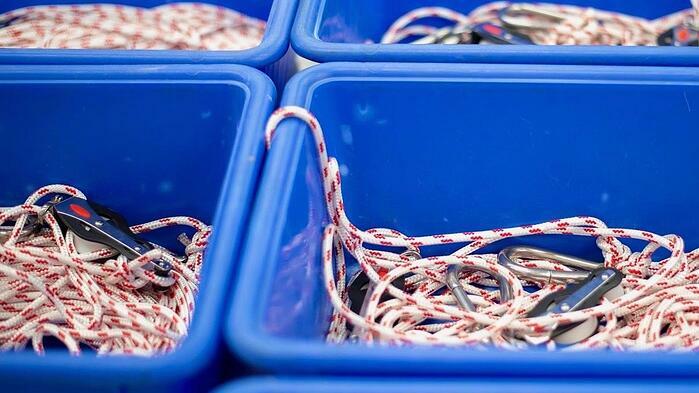 Thimbles protect the rope in smooth, even grooves while also maintaining a proper bending radius when connecting to other hardware (like a shackle or anchor). The use of a thimble, which is free of sharp edges and pinching bends, increases the tensile strength of the rope at its point of termination for high impact loads. When a line needs to change direction within your system, most often you’ll rely on either a sheave or fairlead (or both). Sheaves for steel cable tend to be larger diameters than those needed for fiber rope, due to the rigidness of steel and memory properties of wire. Too much torsional force on a cable can cause bird caging or kinking, which reduces breaking strength and requires the cable to be removed from service. A large diameter sheave provides a gentler curve for the cable. This is less of a concern with synthetic fiber rope, which has no memory and cannot kink. Tighter turns enable more efficient designs. Fairleads to guide synthetic ropes have different needs from fairleads for steel cable. These pieces of hardware reduce vibration and fatigue from rubbing on other surfaces, but the line will still rub on the fairlead. Material properties are therefore critical. Wire cable fairleads (whether rings, hooks, rollers, or just a hole in the surface) are often made from steel, whereas fairleads for synthetic rope tend to be made from smooth aluminum or high strength, low friction polymers with good wear and abrasion resistance. The natural lubricity of Torlon, industrial-grade nylon, and high-performance acetals makes them prime synthetic choices. Near winch drums, steel cables more frequently use roller fairleads, where fiber ropes often use hawse styles. Either way, the fiber rope sheaves, and fairleads tend to be lighter, smaller, and just as durable. Cables for exercise equipment or other complex systems with repeated, continuous forces may change directions several times and risk incidental abrasion with metal parts. The hard wires of a steel cable can cause scrapes, chipped paint, and damage to such nearby surfaces. High-tenacity jackets or coatings can protect the load-bearing core of synthetic lines in these situations, but even jacketed fiber ropes retain their softer exteriors and do less damage through accidental contact. However, this will not mitigate wear and tear left over from previous use of steel cable. Gouging and chipping from metal wire can leave sharp burrs on sheaves, fairleads, drums, shackles—virtually anything the cable contacted. Make sure to carefully inspect equipment you’ve transitioned from cable to fiber rope, and switch damaged parts with load-rated replacements before they harm your new line. Wire is synonymous with steel, but synthetic line includes a plethora of options and fiber compositions. If you’ve considered switching over from steel to fiber rope, investigate the possibilities, such as the high-modulus polyethylene (HMPE) found in industry-favorite Dyneema®.